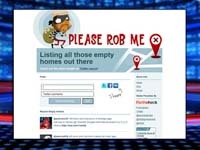 A new Website with the intriguing name "PleaseRobMe" seeks to highlight the potential danger of updating the world, via social networking sites, on your every move. PleaseRobMe is really nothing more than a glorified Twitter search; it aggregates public Twitter feeds that use Foursquare, a social networking game, to announce when users have left their homes. The site reads like a Twitter feed with a sarcastic twist -- each entry has "@username left home and checked in about a minute ago:" before each Tweet. The site is constantly updated with "new opportunities," and you can filter the search results by location or Twitter username.